Rock River Arms AR15 Tool zum anziehen vom Fest -und Schubschaft! 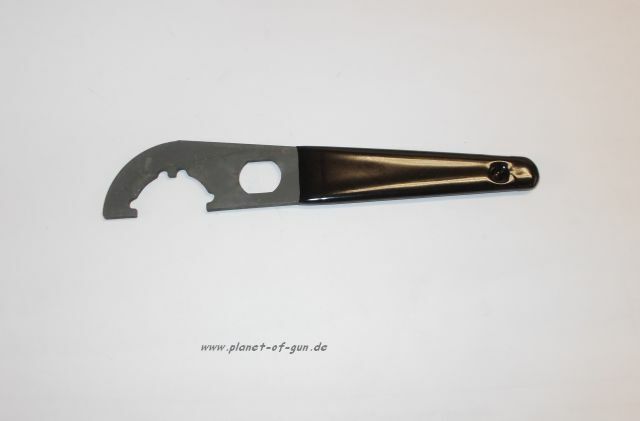 TAPCO AR15 Tool zum anziehen vom Fest -und Schubschaft und zum Bierflaschen öffnen! Multifunction wrench is machined from heat treated steel and features three lugs for a secure fit on Mil-Spec castle nuts. Wrench includes precision cutouts for the receiver extension tube and A1/A2 flash suppressor. Convenient, built-in bottle opener allows you to enjoy your favorite beverage when the job is finished. Wrench is coated in manganese phosphate for corrosion resistance while the rubberized grip provides both safety and comfort. Versatile tool features hardened barrel nut pins and profiles that fit the buffer tube lock nut and flash hider. 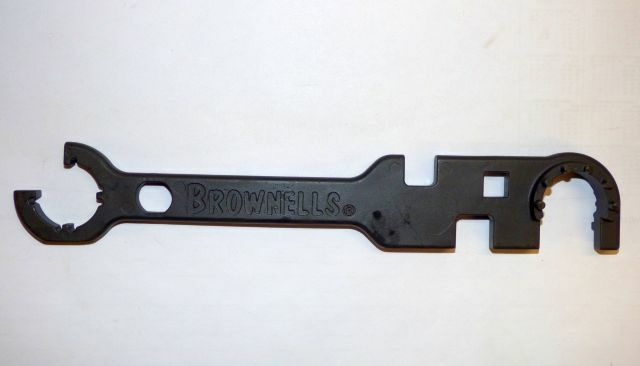 Cut out for a ½" drive allows use with ratchet driver or the included torque wrench. Bit driver and bit holder with six common bits help you work on most parts of the AR-15. Included beam-style torque wrench helps achieve correct torque on AR-15 barrel nut to maximize accuracy potential. Rugged stamped steel construction.